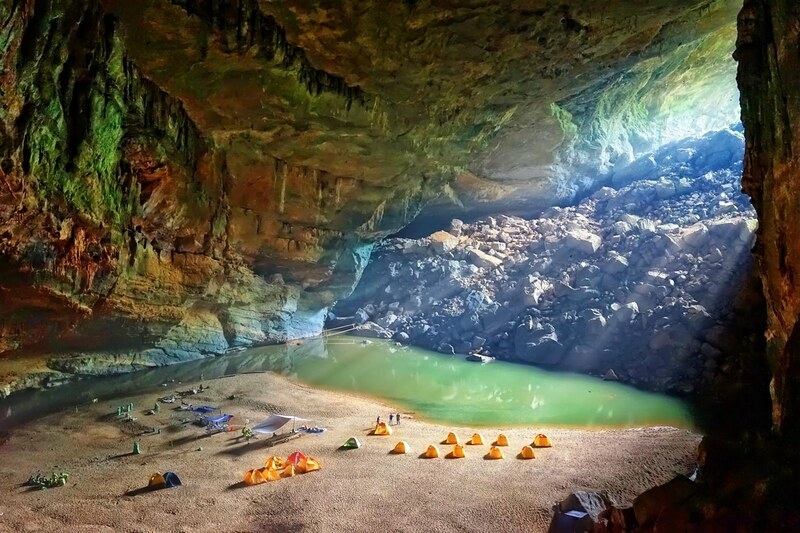 Swallow Cave: Coming to Phong Nha - Ke Bang National Park, tourists will have a chance to admire the majesty of the third biggest cave in the world. More interestingly, the time to explore Hang En Cave is 2 days 1 night. Here is an ideal stop over for those who love adventures but do not have much time. En Cave has a total length of 1,645m with three entrances. Hang En Cave was voted as one of the most spectacular caves in the world by National Geographic. The most special feature of Hang En Cave is the separate ecosystem and climate, along with a beautiful river, which will bring a unique experience to tourists. In this jungle region of central Vietnam, the Hang En Cave is one in a series of mind-blowing caverns discovered by Mr. Limbert, his wife, Deb, 54, also a caver, and their colleagues from the British Cave Research Association. The most enormous cave here is Son Doong Cave, which ranks — alongside Miao Room in China and Sarawak Chamber and Deer Cave in Borneo — as one of the world’s largest caves. Son Doong last year for the first time became accessible to a limited number of tourists, the most established and reputable company running tours in the region’s caves. Going underground, expedition members enter Hang En, a cave tunneled out by the Rao Thuong River. Dwindling to a series of ponds during the dry months, the river can rise almost 300 feet (91 meters) during the flood season, covering the rocks where cavers stand. Hang En Cave is the world’s 3rd largest cave located in Quang Binh, the central province of Vietnam, succeeded only by Deer Cave in Malaysia and Hang Son Doong, also located here in the Cave Kingdom of Vietnam, Phong Nha - Ke Bang National Park. Hang En Cave is of the largest and most beautiful caves in the world, this is close to Hang Son Doong (the world’s biggest cave). To see this cave involves a day trek through beautiful jungle and valleys, and through a minority village, and then an overnight stay in the cave.